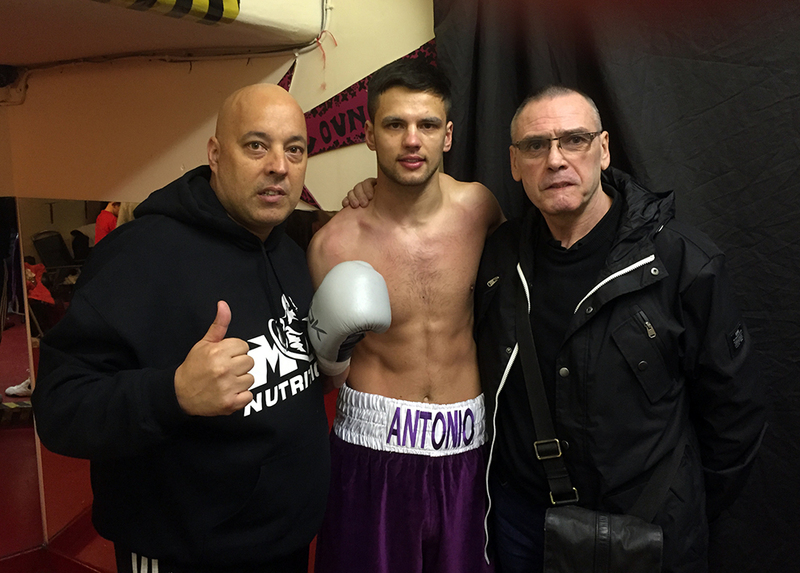 London – Tuesday, 24th March 2015 – On Friday night, on the Stephen Vaughan promoted RED MIST event, that took place at the Grand Central Hall in Liverpool, Birmingham’s Antonio Counihan scored another big win, when he stopped previously undefeated Lukas Radic from the Czech Republic. With both protagonists keen to keep hold of the precious ‘O’ on their record, there were bound to be some nerves jangling, not just the fighters but also from their family and fans seated ringside, especially when the bout got underway. It was Radic that took the early advantage, coming out hard and fast looking for another early finish, however the Counihan was unfazed, instead electing to box off the back of his excellent jab, which effectively kept the dangerous Czech at a distance and thwarted his early attempts. Around the two minute mark, just as Radic forced his way forward once again, Counihan stepped in with a big right to send Radic down to the canvas. Just as referee Mickey Vann was about to reach the end of the count, Radic managed to just make it to his feet, albeit a little unsteadily. Mickey Vann checked to ensure that Radic was able to continue, before restarting the bout. The instant he did the former England amateur captain went straight on the attack, with a double handed assault to both head and body, Radic covered up but the power of the shots raining down on him was too much and within seconds the inevitable happened and Radic made his second visit to the canvas. Once again Radic just made it to his feet, but was clearly disoriented, leaving referee Mickey Vann no option call a halt to proceedings on the two minute and twenty eight second mark of the first round. 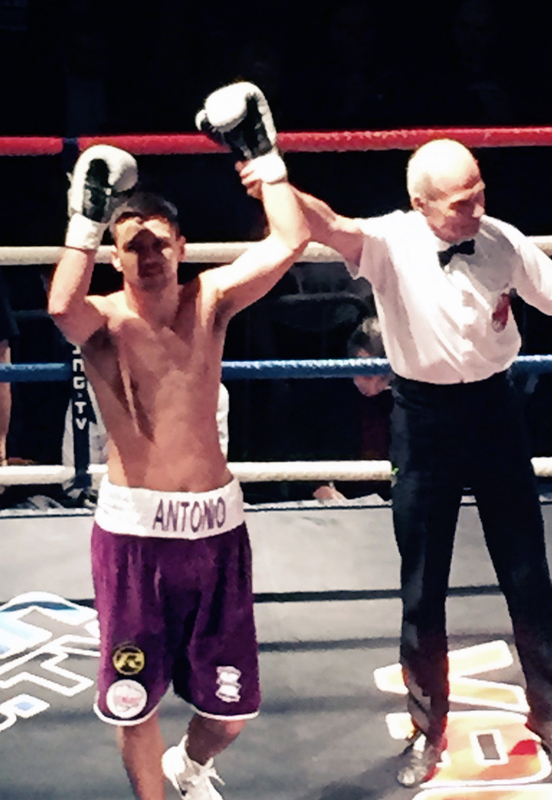 To describe the victory as emphatic is an understatement, Counihan’s class shone through, without doubt the 23 year old proved himself to be one of the leading young prospects in the ultra competitive lightweight division. Speaking from his home earlier Counihan spoke briefly about the fight and the possibility of his first challenge for a Championship in the near future. “Yeah well as everyone had said before it’s a very important fight, both Lukas and myself were unbeaten, so someone’s ‘O’ had to go, which in itself adding extra pressure on the night. Unfortunately he was a late replacement, we didn’t know anything about him, other than he was unbeaten with two big stoppage wins, so didn’t really get time to prepare for him specifically, but as the original opponent was a tough big hitter we knew our preparations should be enough to see us through. I felt good, really good, best shape of my life, which is a credit to my team, best I’ve ever felt going into a fight, I was nice and relaxed and just boxed the way we planned. He’s a good boxer, which made it easier for me, I like boxing people that are happy to box rather than hold on all the time. I didn’t expect to stop him let alone so early, just everything opened up for me and the shot was spot on and he went down, after that I knew I could get him out of there, so went in for the finish. Going to have a little rest now and then get back in the gym and start preparing for my next fight, which will be in Leeds on June 7th. After that hopefully get my first title fight, I’ve been told it will be in Birmingham or Coventry, which will be nice and local for my fans for a change.